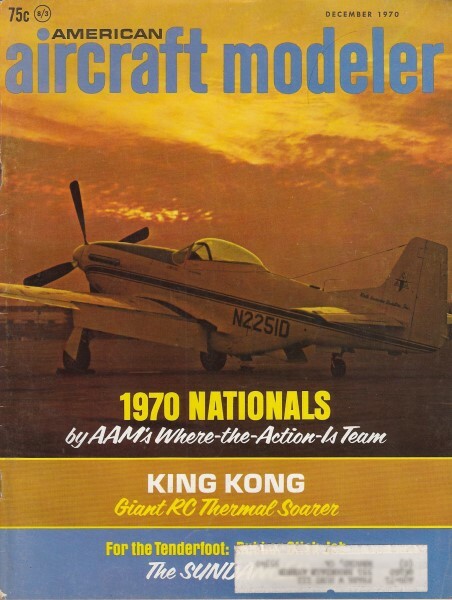 Don Berliner was a prolific researcher and publisher of books about model airplanes and full-size airplanes. 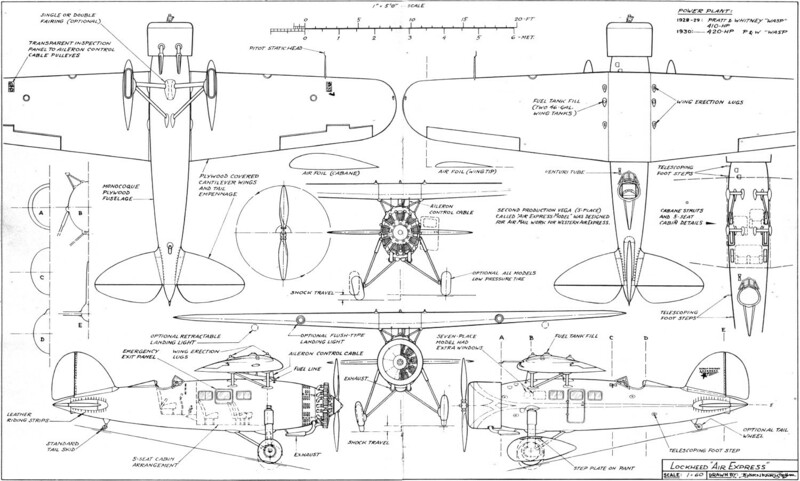 His articles and photographs, often graced by master draftsman and artist Bjöurn Karlström's drawings, appeared fairly often in American Aircraft Modeler. 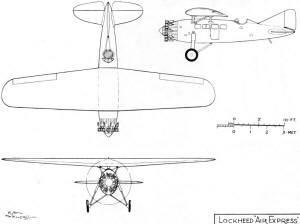 Here, Don gives a brief history of the Lockheed Air Express. One interesting note is that the aircraft featured an open cockpit - even though the passenger compartment was completely enclosed - at the insistence of pilots (many former Air Mail men) who claimed they needed the multi-sensory environment for safe navigation because it allowed them feel the wind shifts and changes in attitude. Website visitor Christopher W. requested this article. When John Northrop designed this four-passenger, 176-mph craft, it was the ultimate in comfort. Though only seven took to the sky, they became world famous. Although it came after the Vega with its enclosed cabin for the pilot, the Air Express reverted to an open cockpit. Three-view shows less successful forerunner of production version. WILL ANYONE REMEMBER how it all started? In a few weeks, as this is written, Lockheed Aircraft Co. will erupt with great gobs of excitement as its newest airliner takes to the skies for the first time. The 250-300-passenger 1011 TriStar will carry with it the hopes and future of a great company which, like so many today, is in somewhat wobbly financial condition. Within a couple of years, scores of these majestic big ships should be cruising the airways. But will anyone remember the Air Express? Before the TriStar came a long line of Lockheed commercial airplanes: the Electra II, the Constellation, the pre­war Electra, the Lodestar, the Vega, and finally back to the Air Express, Lockheed's first passenger carrier. Then, as now, the new airplane was much more than merely the latest combination of technical ideas. It was a big step forward. The world of 1928, when the first Air Express appeared, was a far different place from the one we know today. Airline travel was something that appealed to only a few brave businessmen. Flying demanded nerve and ingenuity and the ability to navigate with only the crudest of instruments and almost no ground-based aids. A 300-passenger, 600-mph luxury liner would have been worthless. Wing Area - 288 sq. ft. Empty Weight - 2533 lb. Gross Weight - 4375 lb. Rate of Climb - 1500 ft./min. Service Ceiling - 17,250 ft. But a four-passenger, 135-mph Air Express with a completely enclosed cabin for the "ultimate" in comfort was a much more realistic project for the time. The machine designed by John Northrop was in many ways a real advancement in the art, and in other ways a step backward. 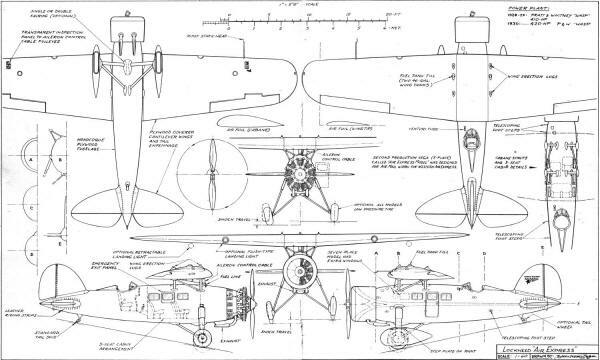 While its basic layout was certainly sleek and streamlined, it placed the pilot far aft of the passenger cabin and out in the open as in most earlier designs. Shortly before the Air Express bowed in, the Lockheed Vega had been introduced to the public. It featured a cockpit just ahead of the cabin, with its windshield faired into the leading edge of the high wing. Airmail pilots of that era were hesitant about being completely enclosed. Many of them were convinced they could fly only if out in the breeze where their practiced ears could sense the winds and changes in attitude. 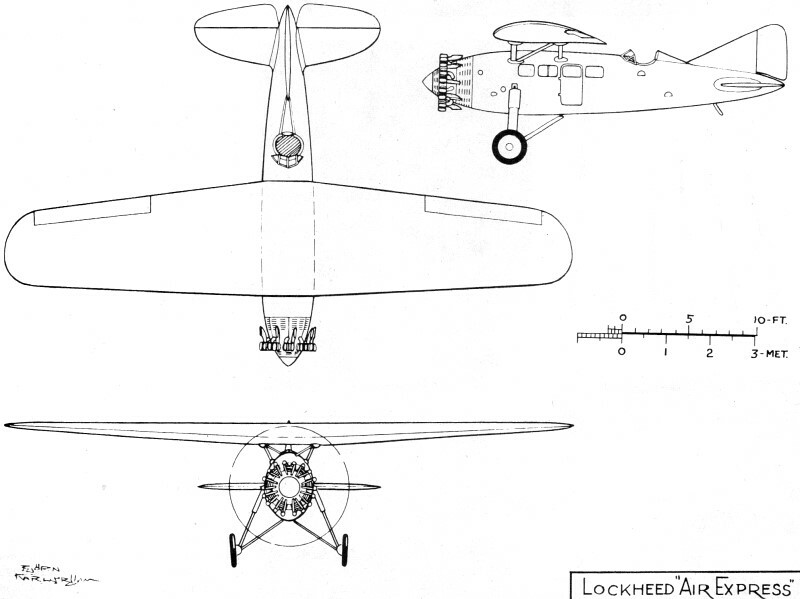 Lockheed went along with this idea and produced the Air Express with an open cockpit and a strut-braced wing to permit forward visibility. The forerunner of the Air Express was a special built for Western Air Ex­press, Inc., in June, 1928. On the first trip for its owners, it was badly damaged in a landing accident at Las Vegas, Nevada, and returned to the factory. There, it was completely rebuilt into the prototype Air Express and became one of the most famous long-distance record setters of its time. Frank Hawks, the famed "Dawn-To-Dusk" pilot, set a West-East transcontinental record of 18 hours, 21 minutes in February, 1929. Then, in late June, he earned his place in the sun by setting back-to-back transcontinental records, flying from New York to Los Angeles in 19 hours, 10 minutes and, after a brief rest, back to New York in 17 hours, 38 minutes. Hawks and the Air Express were famous. Texaco's Air Express was a plush predecessor to today's corporate aircraft. One of the most famous long-distance record setters was flown by Frank Hawks to west-to-east and east-west transcontinental marks in 1929. By then, a full cowl and spinner added to its performance. The first production Air Express was sold to the New York, Rio and Buenos Aires Air Line in March, 1929. It was to have been used for carrying the mail around Argentina - possibly using floats - but the airline was soon bought out by Pan Am and the airplane vanished without a trace. But the next ship off the line more than made up for the lack of fame of its predecessor. NR/NC-3057 lived through several of the most exciting years in the history of any airplane before it was broken up in 1940. Carrying the Lockheed name "The Black Hornet" (other Air Express were built with Pratt & Whitney Wasps; this one had a P&W Hornet), it failed to set a transconti­nental record in 1929 and was sold to the General Tire & Rubber Co. and renamed "The General Tire." Henry J. Brown flew it to first place in the forerunner of the classic Bendix Trophy Race: the Los Angeles-to-Cleveland race of the 1929 Cleveland National Air Races. Its time of 13 hours, 15 minutes was 36 minutes faster than the runner-up Lockheed Vega, and its average speed of 186 mph for well over 2000 miles was a real testimony to its class. The next change in ownership for "3057" saw the beginning of one of the greatest publicity stunts in aviation history. A little known but enterprising airline pilot named Roscoe Turner talked the owner of the Gilmore Oil Co. into buying the airplane, renaming it "The Gilmore Lion" in honor of the firm's trademark, and letting him fly it all over the country in the company of a young lion named (what else?) "Gilmore." Turner, Gilmore, Gilmore products and the cream-and-red Air Express went everywhere and were seen by just about everyone. Yet it wasn't just a series of stunts. There was more to it than flying into one airport after another to dazzle people with the jazzy airplane and to shock them with the playful pet. Colonel Turner was as speed oriented as any pilot of his day, and records were waiting to be broken. In May 1930, he sped from Long Island to Glendale, Calif., in 18 hours, 43 minutes for a new record. It didn't hurt Turner's reputation or Gilmore's sales. The next three Air Express completed were Wasp-powered versions: one for Texas Air Transport, one for the South American airline that was absorbed by Pan Am, and one used for sport by a succession of wealthy New Yorkers. The seventh and last Air Express (not counting two that were never completed but were sold for replacement parts to owners of originals) was ordered in 1930 but not completed until 1931. It was intended for a transatlantic flight that never came off. This last Air Express - NR/NC-974Y - got off to a very slow and discouraging start, but picked up speed and became an historic airplane before it finally was wiped out in a Nevada desert windstorm in 1942. Hoping to be the first woman to fly from New York to Paris, young Laura Ingalls laid her tiny hands on the Air Express after the sponsoring Atlantic Exhibition, Inc., gave up, and the two became fast friends. Miss Ingalls had already made a name for herself in aviation by claiming, among other things, a couple of typical Roaring Twenty's records: 980 consecutive loops and 714 consecutive barrel rolls. During March and April, 1934, Laura Ingalls became the first person to fly solo around South America, her 23-country flight covering almost 17,000 miles and winning her the 1934 Harmon Trophy. This was followed by a second place in the 1936 Bendix Trophy Race in a Lockheed Orion. In 1936, the Air Express was sold to the Masakatsu brothers who hoped to fly it non-stop to Japan but never did. Two more owners and half a war later, the last of the Air Express line bit the dust. There isn't much left now. None of the seven airplanes is known to exist, and the pilots who made headlines in them are gone, too. The open-cockpit Lockheed was more glamorous but the Vega became the commercial success. The prototype Air Express flown by Frank Hawks was a rebuilt special made for Western Air Ex­press, Inc., in June of 1928. The first production model was sold to the New York, Rio and Buenos Aire's Air Line-in 19'29. P&W power. Hornet ver­sion averaged 186 mph in 2000-mile air race.